It's not really that unusual to see people working on a roof. Roof repairs have to be done, after all. But what I find interesting is the ease with which Sri Lankan workers tromp all over roofs that I would think should collapse under the weight of a small adult. And then there are those roofs which are covered with terracotta shingles – are they called shingles? – and manage to not slip on them or dislodge them. Because those terracotta shingles? Not nailed down or otherwise attached to anything. Nope. And here we have five guys on the roof with a sixth coming up the ladder. They could be fixing air conditioning units for all I know. Anyway. Here it is, for your viewing pleasure. 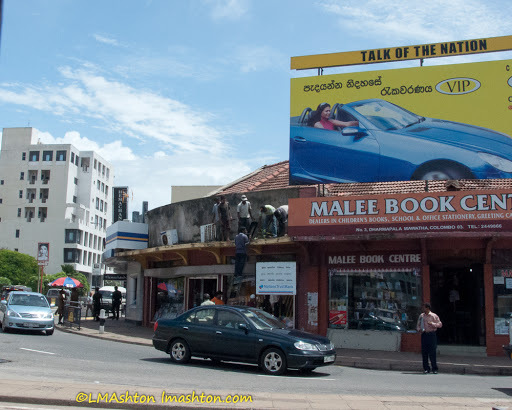 This picture was photographed in Colombo, Sri Lanka. That's cool- are you visiting Sri Lanka? Yes, they are called shingles. You saying nothing is holding them up there terrifies me. In 1999, I was living in Germany, and a huge wind/ice storm racked Europe (20,000 trees uprooted at Versailles alone, for example). I had terra cotta shingles on my roof, but more than a few decided they wanted to be free. They’re not so fun when they fall on you. Socalgal, I think I wasn’t clear enough. There are no nails keeping them in place, so they can easily move or be dislodged. And if one breaks, then you get leaks of course. BUT they are placed on something. It could be sheets of asbestos (because, yes, that’s still very much in use in Sri Lanka) or something else like that. I’m probably just a little paranoid. Except Fahim really doesn’t like walking on the roof, either. Roofing tiles? That’s the proper term?